At the end of August I took the decision that I was going to sell the majority of my positions. I did it. In September I was astonished with the defiance to gravity of the market and a little bit pissed-off with the trend. Now in October, specially in the second half of the month, I have seen how this has been evolving. The Q3 closing reports seemed to be the flutter of the butterfly that changed the trend. It’s just a graphic, it’s just a figure, it’s just a coincidence, but I’m happy about all I learned to be able to draw it. Reading the Standard for Program Management book and other sources of data for program management I found something interesting about the skills that a program manager has to have. To me the last one “integration skills” is the more important one in the initiation phase of a program. The ability to abstract at program level, having the program picture, its dependencies, project initiatives involved in the process, project components and how to integrate them is one of the most important skills to be able to manage a program. Without this, the other things are useless. 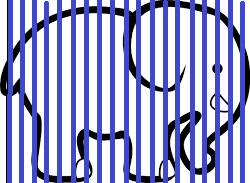 How do you eat an elephant? cutting in pieces and then in slices. Program activities are tasks and work conducted to support a program and which contribute throughout the program life cycle. The program activities enable a strategic approach to planning, monitoring and controlling, and delivering program outputs and benefits. Program management supporting activities require coordination with functional groups in the organization— but in a broader context than similar activities supporting a single project. The program governance is explained briefly in the chapter 8 of Strategic Program Management fourth edition. I have created this diagram as summary of the different isolated diagrams published in the book. I have created a map very similar to the one that is shown in the chapter 7 that summarizes the core and supporting activities. 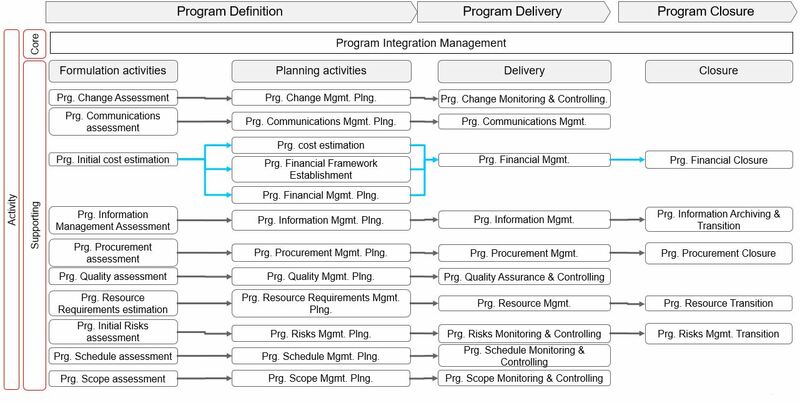 Interestingly, there is not any section that talks about program integration (the only core activity). Program Life Cycle Management performance domain facilitates effective program definition, program delivery, and program closure. These components may include projects, subsidiary programs, and additional program-related activities that are necessary to achieve the specified goals and objectives. Since programs, by nature, involve a certain level of uncertainty, change, complexity, and inter-dependency among the various components, it is useful to establish a common and consistent set of processes that can be applied across phases. Program Life Cycle Management spans the duration of the program, during which it contributes to and integrates with the other program domains as well as the supporting program activities. A program is defined, benefits are delivered, and the program is closed. The programs involve the coordination and sequencing of multiple components above what is required at an individual project level. The program activities begin before funding in approved. During program delivery, components are authorized, planned, and executed, and benefits are delivered. Program closure is then approved by the program steering committee when the desired benefits or program objectives have been realized or the steering committee has determined that the program should be terminated. Program Definition Phase. This phase consists of program activities conducted to authorize the program and develop the program roadmap required to achieve the expected results. Program Delivery Phase. Program delivery comprises the program activities performed to produce the intended results of each component in accordance with the program management plan. Program Closure Phase . This phase includes the program activities necessary to transition the program benefits to the sustaining organization and formally close the program in a controlled manner. During program closure, the program is transitioned and closed or terminated early, or work is transitioned to another program. 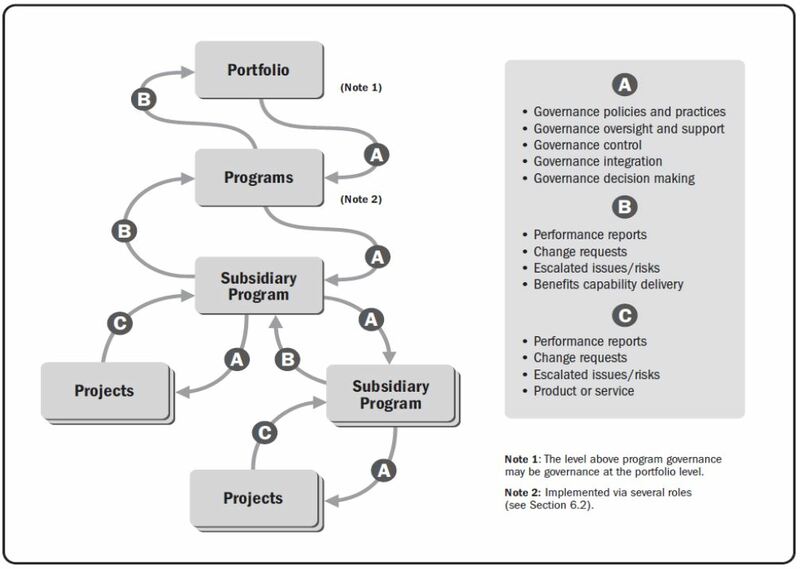 There may be a number of activities executed by a portfolio management body prior to the start of the program definition phase. The primary purpose of the program definition phase is to progressively elaborate the goals and objectives to be addressed by the program, define the expected program outcomes and benefits, and seek approval for the program. Develop a program charter and roadmap. The candidate program is compared with other organizational initiatives to determine the priority of the program under consideration. This analysis helps determine the probability of the program’s successful delivery of organizational benefits and helps identify risk response strategies and plans. Justification. Why is the program important and what does it achieve? Vision. What is the end state and how will it benefit the organization? Strategic alignment. What are the key strategic drivers and the program’s relationship to the organizational strategic objectives and any other ongoing strategic initiatives. Benefits . What are the key outcomes required to achieve the program vision and benefits? Scope. What is included within the program and what is considered to be out of scope at a high level? Components. How are the projects and other program components configured to deliver the program and the intended benefits? Risks and issues. What are the initial risks and issues identified during the preparation of the program roadmap? Timeline. What is the total length of the program, including all key milestone dates? Program governance . What is the recommended governance structure to manage, control, and support the program? Program delivery phase includes program activities performed to produce the intended results of each component in accordance with the program management plan. The program manager is also responsible for managing this group of components in a consistent and coordinated way in order to achieve results that could not be obtained by managing the components as stand-alone efforts. Component authorization and planning: involves the initiation of components based on the organization’s specified criteria and individual business cases developed for each component. These criteria are generally included in the program governance plan. The Program Governance Performance Domain provides guidance for processes leading to component authorization. Component transition and closure . After the program components have produced deliverables and coordinated the successful delivery of their products, services, or results, these components are typically scheduled for closure or transition to operations or ongoing work. Prior to the end of the program delivery phase, all component areas are reviewed to verify that the benefits were delivered and to transition any remaining projects and sustaining activities. Program delivery ends when program governance determines that the specific criteria for this phase have been satisfied or a decision is made to terminate the program. Program closure phase includes program activities necessary to transition program benefits to the sustaining organization and formally close the program in a controlled manner. (b) there is another program or sustaining activity that will oversee the ongoing benefits for which this program was chartered. Program activities and integration management are concerned with collectively utilizing the resources, knowledge, and skills available to effectively deploy multiple components throughout the program life cycle. All work performed in a program for the purpose of overall program management is collectively known as program activities. It is important to note that program activities directly support the individual components to ensure the component activities help achieve the program objectives. is the core activity that occurs across the entire program life cycle. a) Program infrastructure development its primary purpose is twofold. It establishes both the management and technical resources of the program and its components. This infrastructure refers to both personnel and to program specific tools, facilities, and finances used to manage the program. Although the program manager is assigned during program definition, the program management core team is designated as part of establishing the program infrastructure. 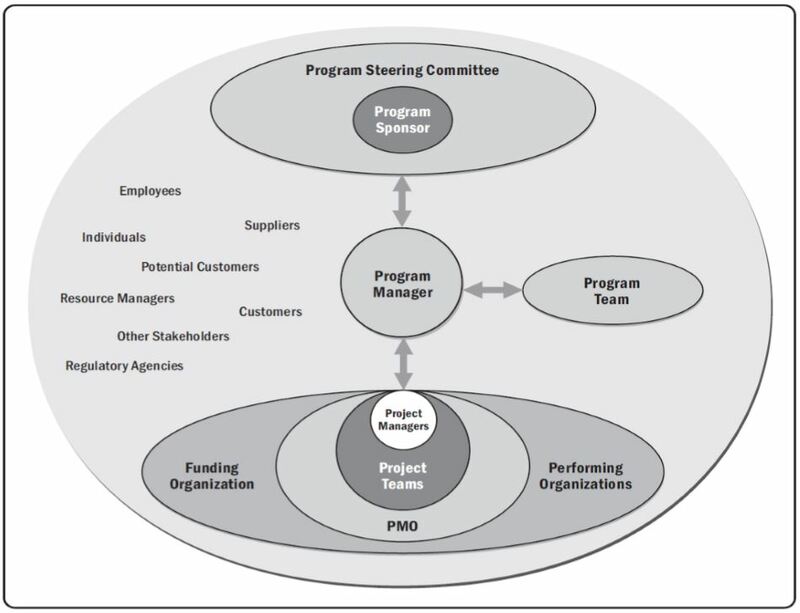 For many programs, the program management office (PMO) is a core part of the program infrastructure. It supports the management and coordination of the program and component work. Other tools and activities as required. b) Program delivery management includes the management, oversight, integration, and optimization of the program components that will deliver the capabilities and benefits required for the organization to realize value. 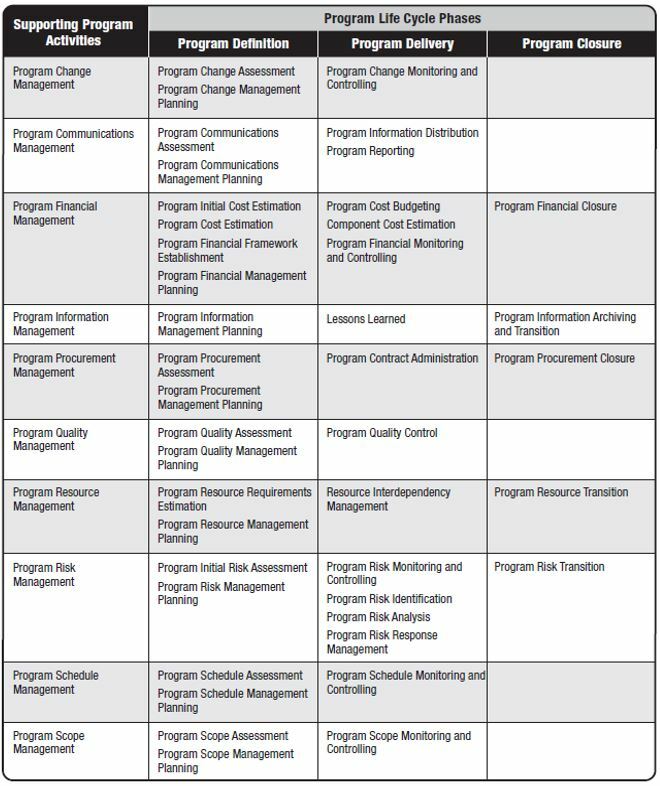 These activities are performed throughout the program delivery phase and relate to the initiation, change, transition, and closure of program components. c) Program performance monitoring and controlling are performed by both program- and project-level components during delivery management. These activities include collecting, measuring, and disseminating performance information to track progress against the program objectives and assess overall program trends. Typical outputs of this ongoing activity include program performance reports and forecasts. Program performance reports include a summary of the progress of all program components. d) Benefits sustainment and program transition. Some program components produce immediate benefits while others require a hand-off or transition to another organization in order for the ongoing benefit to be realized. Benefits sustainment may be achieved through operations, maintenance, new projects, or other initiatives and efforts. e) Program closeout. As part of the program governance plan, a final program report may be required to document critical information that can be applied to improve the success of future programs and component projects. Archive plan for program documentation. Upon program completion, knowledge transfer is performed when the program management team assesses the program’s performance and shares lessons learned with the organization. Benefits, performance metrics, and measurement . List of the methods and metrics used to evaluate the program and evaluate component contributions to benefits, and a description of how information on the components will be collected, consolidated, and reported (e.g., a balanced scorecard or dashboard). Stakeholder engagement. A listing of the stakeholders who should be engaged and communicated with during the program’s life cycle and governance activities. Program charter. Authorizes the program management team to use organizational resources to pursue the program and links the program to its business case and the organization’s strategic priorities. Program managers rely on the program steering committee (also referred to as the program governance board, oversight committee, or board of directors) members to establish organizational conditions that enable the effective pursuit of programs and to resolve issues that inevitably arise when the needs of their program conflict with the needs of other programs, projects, or ongoing operational activities. A stakeholder is an individual, group, or organization that may affect, be affected by, or perceive itself to be affected by a decision, activity, or outcome of a project, program, or portfolio. Balancing stakeholder interests is important, considering their potential impact on program benefits realization or the inherent conflicting nature of those interests. People have a tendency to resist direct management when the relationship does not have a hierarchical affiliation. Supports training initiatives as needed within the context of the program or related organizational structure of the program component. This two-way communication enables the program manager to deliver the benefits for the organization in accordance with the program charter. People have the propensity to resist change whenever they have not directly requested it, have not participated in creating it, do not understand the necessity for it, or are concerned with the effect of the change on them personally. What is a stakeholder engagement? Stakeholder engagement is often expressed as direct and indirect communication among the stakeholder and the program’s leaders and team. Stakeholder engagement, however, includes more than just communication. For example, stakeholders can be engaged by involving them in goal setting, quality analysis reviews, or other program activities. The primary objective is to gain and maintain stakeholder buy-in for the program’s objectives, benefits, and outcomes. The complexity of those environments warrants the efforts of the program manager to understand and manage the wide stakeholder base. Figure below depicts a diverse stakeholder environment that may shape the actions needed to manage those expectations. Beyond the communications aspect, stakeholder engagement concerns negotiation of objectives, agreement on desired benefits, commitment to resources, and ongoing support throughout the program. It aims to identify all key stakeholders (or stakeholder groups) in the stakeholder register. and other characteristics or attributes the program manager feels could influence the stakeholders’ perception and the program’s outcomes. should be established and maintained in such a way that members of the program team can reference it easily for use in reporting, distributing program deliverables, and providing formal and informal communications. is a dynamic document, as the program evolves, new stakeholders may emerge or interests of current groups may shift. It categorizes the stakeholders (needs, expectations, or influence) in order to start analyzing them. Key information should be obtained from stakeholders in order to better understand the organizational culture, politics, and concerns related to the program, as well as the overall impact of the program. It allows the program team to make informed decisions about how and when to engage stakeholders, taking into account their interest, influence, involvement, inter-dependencies and support levels. It outlines how all program stakeholders will be engaged throughout the duration of the program. Ability to influence the outcome of the program. Stakeholder engagement is a continuous program activity because the list of stakeholders and their attitudes and opinions change as the program progresses and delivers benefits. One of the primary roles of the program manager throughout the duration of the program is to ensure all stakeholders are adequately and appropriately engaged. The stakeholder register, stakeholder map, and stakeholder engagement plan should be referenced and evaluated often, and updated as needed. Interacting and engaging with stakeholders allows the program team to communicate program benefits and their relevance to the organization’s strategic objectives. When necessary, the program manager may utilize strong communication, negotiation , and conflict resolution skills to help defuse stakeholder opposition to the program and its stated benefits. Large programs with diverse stakeholders may also require facilitated negotiation sessions among stakeholders or stakeholder groups when their expectations conflict. The primary metrics for stakeholder engagement are positive contributions to the realization of the program’s objectives and benefits, stakeholder participation, and frequency or rate of communication with the program team. The history of stakeholder participation provides important background information that could influence stakeholder perceptions and expectations. As the program team works with the stakeholders, it collects and logs stakeholder issues and concerns and manages them to closure. Use of an issue log to document, prioritize, and track issues helps the entire program team understand the feedback received from the stakeholders. When the list of stakeholders is small, a simple spreadsheet may be an adequate tracking tool. For programs with complex risks and issues affecting large numbers of stakeholders, a more sophisticated tracking and prioritization mechanism may be required. Effective communications create a bridge between diverse stakeholders who may have different cultural and organizational backgrounds, different levels of expertise, and different perspectives and interests, all of which may impact or influence the delivery of benefits by the program. The program manager should actively engage stakeholders throughout the life cycle of the program, with particular attention to those key stakeholders who are high in power and influence. It is important that decision-making stakeholders are provided with adequate information to make the right decisions at the right time necessary to move the program forward. The program manager should continually monitor changes and update stakeholder engagement activities and deliverables as needed. Through the program delivery, the program components are planned, developed, integrated and managed, to facilitate the delivery of the intended program benefits. Benefits are essential part of program’s deliverables. Business case serves as a formal declaration of the program benefits, the expected delivery and the justification for the resources. is developed based on the program business case, the organization’s strategic plan and other relevant program objectives. is reviewed with key stakeholders to develop the appropriate performance measures for each benefit. is updated during the delivery of the program with the collection of qualitative and quantitative measures. Quantify the incremental delivery of benefits and plan it in the right place (include the timing). Delays on benefits can have negative consequences on the overall program. Determine whether the benefits exceeds their control threshold. Assumptions linked to each benefit, determine how the benefit will be achieved. Link component outputs to planned program outcomes. Define metrics and procedures to measure benefits. Define how resulting benefits and capabilities will be transitioned into operations. Provide a process for managing the overall benefits management effort. The program roadmap should include the incremental benefits delivery. The benefits delivery ensures there is a set of reports or metrics reported to the program. Benefits management is an iterative process. Benefits analysis and planning may be continuously revisited as conditions change. Corrective actions on program components may be needed in response to information gained from monitoring the organizational environment. These corrective actions may require that program components be added, changed or terminated during the benefits delivery phase. The purpose of this phase is to ensure that the program benefits are transitioned to operational areas. The receiving organization is responsible of all preparation processes and activities. The receiving organization should have a clear understanding of the capabilities or results to be transitioned and what is required for the entity to successfully sustain the benefits. The remaining risks should be monitored. The purpose of this phase is the ongoing maintenance activities performed beyond the end of the program, to ensure continued generation of the improvements and outcomes delivered by the program. Benefits must be sustain through operations, maintenance, new components, or other efforts. The benefits management plan should define the continuation of benefits delivered during the ongoing activities. The program manager is responsible for planning these post-transition activities during the performance of the program. Planning the necessary recipients to continue monitoring performance. Implementing the required change efforts. Monitoring the performance of the product/service/capability. Monitoring the continued suitability of the product/service/capability. Monitoring the continued availability of the product/service/capability. Provide on-demand support for the product. Planning for and establishing operational support of the product/service/capability. Planning the retirement and phase-out of the product/service/capability. Developing business cases and potential initiation of new projects/programs to respond to operational issues with the deployed product/service/capability. Monitoring any outstanding risk affecting the program’s benefit. Program strategy alignment is a program performance domain that is initiated during the program definition phase with the development of the business case, program charter and program roadmap, supported with the inputs from environmental assessments and program risk management strategy. The effort results in the development of a program management plan that is aligned with organizational goals and objectives. It is important to understand how the Strategic development process. In this way, if we do the process in the right way, we will be able to link the program initiatives with the organization goals and objectives. 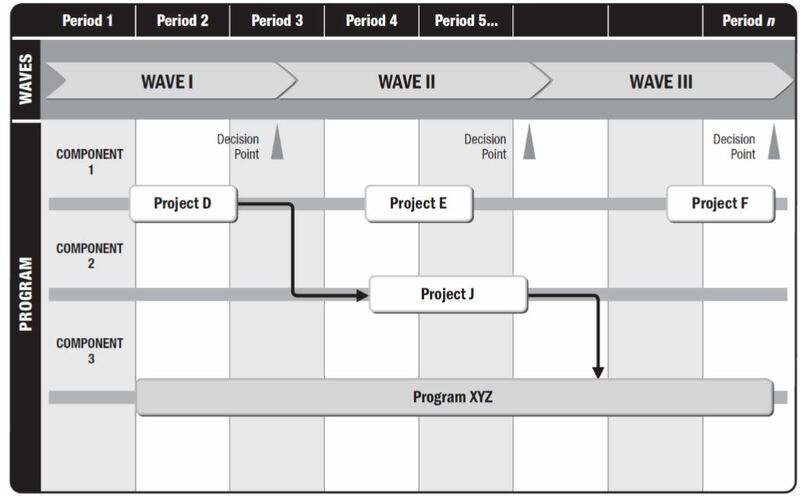 The program roadmap is a chronological representation of a program’s intended direction, graphically depicting dependencies between major milestones and decision points, which reflects the linkage between the business strategy and the program work. The program roadmap also reflects the pace at which benefits are realized and serves as a basis for transition and integration of new capabilities. There are often internal or externalinfluences to the program that have a significant impact on a program’s success. Program managers should identify these influences program in order to ensure ongoing stakeholder alignment, the program’s continued alignment with the organization’s strategic goals and objectives, and overall program success. Enterprise environmental factors external to the program may influence the selection, design, funding, and management of a program. The following sections outline various forms of analysis that may be used to assess the validity of a program’s business case and program management plan. Comparative Advantage Analysis: Where appropriate, comparative advantage analysis may also include what-if analyses to illustrate how the program’s objectives and intended benefits could be achieved by other means. Feasibility Studies: Using the business case, organizational goals, and other existing initiatives as a base, this process assesses the feasibility of the program within the organization’s financial, sourcing, complexity, and constraint profile. Swot Analysis: An analysis of the strengths, weaknesses, opportunities, and threats (SWOT) faced by a program provides information for optimizing the program charter and program management plan. Assumptions Analysis: Program managers regularly identify and document assumptions as part of their planning process. In addition, assumptions should be validated during the course of the program to ensure that the assumptions have not been invalidated by events or other program activities. Historical Information: Analysis Historical information includes artifacts, metrics, risks, and estimations from previous programs, projects, and ongoing operations that may be relevant to the current program. Historical information describing the successes, failures, and lessons learned is particularly important during program definition. Successful delivery of the program roadmap, aligned with organizational strategy, and with consideration to the environmental factors found in the environmental assessments, depends on a well-defined program risk strategy. Risk Management For Strategy Alignment: This risk management strategy includes defining program risk thresholds, performing the initial program risk assessment, and developing a high-level program risk response strategy. Program Risk Thresholds: Risk threshold is the measure of the degree of acceptable variation around a program objective that reflects the risk appetite of the organization and program stakeholders. Initial Program Risk Assessment: While program risk management is conducted throughout the life of the program, the initial program risk assessment, prepared during program definition, offers a unique opportunity to identify risks to organizational strategy alignment. Program Risk Response Strategy : Program risk response strategy combines the elements of the risk thresholds and the initial risk assessment into a plan for how program risks will be managed effectively and consistently throughout the life of the program. For each identified risk, the risk thresholds can be used to identify the specific response strategy based on a number of rating criteria. A robust program risk management strategy comprises a specific risk response strategy for each of the risk rating levels that have been developed to reflect the program’s risk thresholds. Risk appetite: It is the degree of uncertainty an entity is willing to take on in anticipation of reward. Risk tolerance: It is the degree or volume of risk that an organization or individual will withstand. Risk threshold: it is the level of impact at which a stakeholder may have a specific interest. The program charter formally expresses the organization’s vision, mission and benefits expected to be produced by the program. It also defines program-specific goals and objectives in alignment with the organization’s strategic plan and in support of the business case. The steering committee approves first the business case, so the economic justification is clear; then the program charter is reviewed and authorized. This program charter approval gives the program manager the authority to start the program, other subsidiary programs, projects or related activities. and a clear definition of success. The approval of the business case authorized “why”, the approval of the program charter authorizes the “how”. But, let’s say “how” at high level or at initial stage, as it is the program management plan the document that defines the “detailed-how”. this is, in a nutshell what a program business case is. The business case is used to establish validity of benefits to be delivered by a program. Is developed to assess the program’s investment against the intended benefits. it’s done to help the organization to achieve these goals. it is the primary justification document for an investment decision. Defines the success criteria that is maintained through the program. Enables to calculate the variance between the planned outcomes and the achieved outcomes. It can be basic, high-level or detailed.